I had an absolute blast at Boxing Day Sew In on Twitter. Maybe I didn’t get so much sewing done, but the friendship & the comments were priceless. And that’s what I’ll remember the day giggling & commenting & feeling good about quilting. So we asked each other, when do you want to do this again? And New Years is just around the corner! So let’s sew New Years on Twitter. I was intending for me to sew on New Years Day, but there are several people who would rather sew on New Years Eve instead. So let’s make this hashtag all inclusive for New Years Day & New Years Eve. 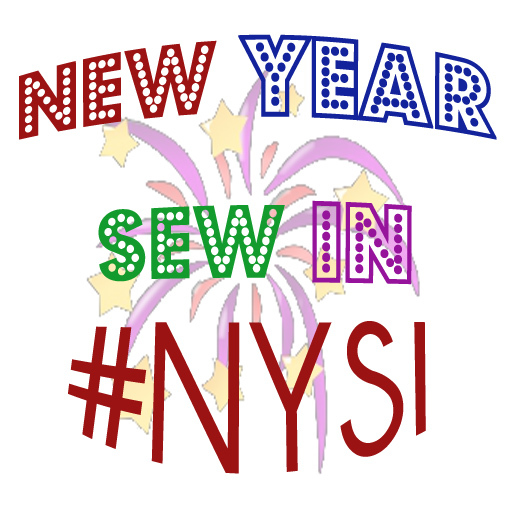 I personally won’t be sewing too much New Years Eve, due to work, but I will try to tweet out on New Years Day (early probably). That and many parts of the world will already be celebrating the New Year by the time it gets to our part of the world. I found TweetChat to be very helpful for managing all the comments on Boxing day, and if you have that in the top & post from TweetChat it automatically adds the hashtag to all your tweets! And I know there are several others who have said they will join me already. Pop in say hi, show off your stuff. Start the new year off right or end the new year with a bang. A sewing bang. I have an image on flickr that you can download & use if you would like. Find it here. Click View all sizes, and use whatever size you want. Or try this link to view all sizes of NYSI. Maybe I’ll get to sew this time round. BDSI didn’t work out for me. I will be there, though I had trouble joining the fun at BDSI on Twitter. I could see all the comments and even did a “test” post but then any other comments didn’t hit the BDSI group. Sounds great! I’ll be recovering from dental surgery but will plan to be on tweetchat and hopefully join in.